Scans have been scheduled in Michigan!! 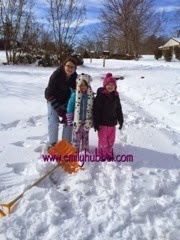 The girls have been out of school for the past week due to the snow storm we had in Virginia but they are going back tomorrow. Friday daddy is taking Emily and Brianna to the daddy/daughter dance. Emily is excited to get all dressed up and dance the night away with her dad! Can't wait to share pictures. Saturday is grandads birthday so we will be doing then and packing. Sunday March 1st we have our first leg of our trip to Pittsburgh and then Monday drive the rest of the way to Michigan. Monday night grandad (my dad) will be flying in to Michigan and staying with us to be there with us as we go through the stressful time of scans. Tuesday Emily has labs, injection for MIBG and hearing test and then Wednesday we have scans and meet with Sholler to go over results! Stress is certainly among us as scans are coming close. 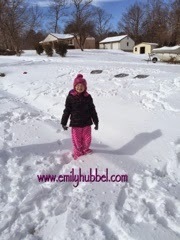 Emily has been doing well and we hope that continues to mean that she is stable as she has been. 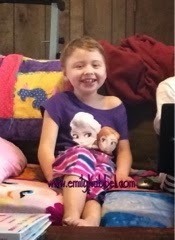 Please continue to keep Emily in your thoughts for stable scans. Don't forget to wear your Emily Gear and/or bracelets and if you don't have that wear pink and purple (Emilys favorite colors). If you think about it share them with us we love to see the Emily love! !